Excessive generosity to outside people. Uncomfortable when others are incurring attention or praise. If can't be centre of attention will either discredit or leave the experience. May fake illnesses or problems to procure attention / sympathy. Abusive verbal behaviour when angered or insecure. Tendency toward violent and even criminal behaviour. Inappropriate and inapplicable language in front of women and children. Dark moods that affect others. Glorifies and falsifies achievements past and present. Expects to be recognised and praised. Finds others not complying with wants intolerable. Disdain for rules, regulations, decency and morality. Very little consideration for how behaviour affects others. Extreme lack of compassion or sensitivity towards love partners (and others') problems. Grossly unsupportive to familiars in times of need. Brushes incidences under the carpet. Uses allies real or imagined to back up claims and arguments. Uses guilt and manipulation to influence. Tendency towards unreasonable jealousy and possessiveness. Capable of sexually degrading name calling. Can steal, harm or hide property to sabotage others. Uses vengeance, threats and intimidation to control. Uses excessive charm and manipulation to control. Little (if any) sense of conscience. Discredits lpeople to gain attention / sympathy from others. Will 'attack' when confronted or questioned. Emotionally punishes others when feeling insecure. Emotionally punishes others when struggling with issues, losses, grief or challenges. Employs unpredictable and unaccountable behaviour. Capable of 'disgusting' behaviour to gain the upper hand and control a situation. Feels powerful and fulfilled when creating powerlessness in another. Gross failure to apologise or have sympathy after creating tears, distress or trauma to others. "I had them eating out of my hands." "You didn't let me finish what I was saying." "Just because I didn't do what you wanted when you wanted it." "Just because I didn't say what you wanted to hear." "You're the only person who misunderstands what I say. You're totally over-emotional." "I'm sorry, what more do you want from me." "Why can't you just get over the past?" "You make me behave like this." "You're the only person in the world I have these problems with." "You act like my mother / father," or, "You're a control freak." Gaslighting is a form of psychological abuse that is used by narcissists that is deeply insidious and difficult to pinpoint. It works by instilling confusion. If you are being gaslighted you'll lose trust in your senses, identity and common environment. What you are feeling and thinking. An interaction that you believed was decent with another person actually had agendas connected to it. Your body language appears suggestive to other people. A friend or family member has made certain references about you. You were seen in a certain place acting inappropriately. You said or did something (you weren't aware of) when tired, distracted, unaware, intoxicated or asleep. Certain information was discovered about you. Certain people (you thought were loyal) are now agreeing about your faults. The incident (created by the narcissist) was your fault, or merely a perception based on your paranoia or unstable emotions. An excuse for the incidence based on a 'story' that extracts guilt from you, whereby you feel awful for making the 'judgement' you did. Other people perceive you as bossy, controlling, manipulative, uncaring, incapable etc. (defective in some way). Telling you repetitively to lower your voice. Interrupting you with unrelated conversation. Telling you to let them finish what they are saying whilst continuing to be psychologically and verbally abusive. Making references to allies and unrelated people. Telling you the matter is resolved without validating the conversation in a way that allows you to feel resolved. Asking if you are happy to get that off your chest and then changing the topic. Throwing in an abusive unrelated comment to anger or upset you. Refusing to discuss the issue with you. Bringing up an issue they are unhappy about, and treating that as the focus of conversation. Sadly, because narcissists inflict such severe psychological abuse upon love partners, a perverse addiction often occurs. The 'victim' has idolised the narcissist (the illusion created via charm that the narcissist originally used to hook the person) and continuously tries to win the approval, love and trust of the narcissist. There are many other reasons why this addiction occurs which are outlined in the article Narcissism Understood. To the outside world it may seem that the other person is deranged and is the problem (the narcissist has expertly created this illusion). 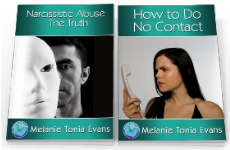 The narcissist will often appear strong and stable to extended family, acquaintances, counsellors and even authorities. Tragically in many cases the victim will believe that they are in fact damaged, incapable, no good and defective. They often think they are at fault. Such feelings are the result of a severely diminished sense of identity and a battered self-esteem. 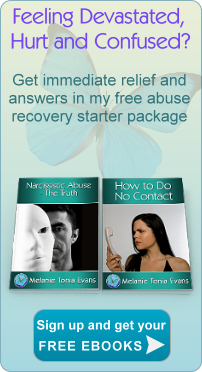 Many people who are narcissistically abused suffer profound depression and even severe physical deterioration. Frighteningly, many victims of narcissism don't recover their sense of self, even years after the relationship has expired. Narcissism addiction and devastation is a common occurrence and can happen to any individual from any demographic, regardless of their level of intelligence and self-sufficiency. The disease of narcissistic addiction is an emotionally based issue, it has little to do with practical and mental capabilities or physical attributes.